The item A people's history of the United States represents a specific, individual, material embodiment of a distinct intellectual or artistic creation found in Evansville Vanderburgh Public Library. 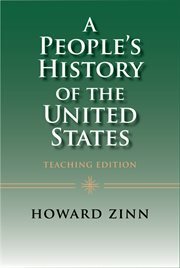 The Abridged Teaching Edition of A People's History of the United States has made Howard Zinn's original text available specifically for classroom use. With exercises and teaching materials to accompany each chapter, this edition spans American Beginnings, Reconstruction, the Civil War and through to the present, with new chapters on the Clinton Presidency, the 2000 elections, and the "War on Terrorism." People's history of the United States., Selections.